Being a photo blogger, I often get asked if my photos are "Photoshopped". Well, when I started digital photography I did use Photoshop on a Windows PC. However, when I got a DSLR that produced RAW files, I found I ended up doubling my file storage, as I would have the original RAW file and an equally large edited .psd file from Photoshop. Also Photoshop is not good at cataloguing or viewing files and I never really got along with the Adobe Bridge file manager viewer that works with Photoshop. So I moved to Lightroom 2 as it is a file manager, viewer editor and printer; all in one. As you edit a RAW file, it just saves a small "recipe" of your changes alongside the RAW file so is much more efficient in terms of file storage space. It is also very fast at browsing files and finding catalogued files. People also ask if I need to heavily edit the photo files you see on this site. The answer is no and I find that Lightroom has more than enough tools to do the job. So I happily upgraded to Lightroom 3, when it came out. Mostly I just straighten the horizon, sometimes I crop into 16:9 widescreen format like here, to cut out excess sky and sea from landscapes. Also, I use an HD projector at my sea kayaking talks and it uses 1920x1080 pixels. When I am exporting resized photos for the web or slide shows, Lightroom is very good because it will allow batch resizing to the longest edge, if you want portrait and landscape shots to be the same area, or to a fixed edge e.g. vertical edge. This is great if I am preparing a mixed group of landscapes and portrait shots for projection, I will just resize them all to 1080 pixels on the vertical edge to get best results. Lightroom also has a built in database of the common faults (eg vignetting, barrel/pin cushion distortion) of a wide range of lenses. It has a tool that when ticked will automatically "correct" a photo using the lens data in the EXIF header. I use this a lot with my Canon L lenses. Other edits I do will usually involve exposure corrections. Either the overall exposure or more commonly recovering detail in the shadows and highlights. Lastly, in landscapes, especially if in blueish hazy conditions, I will sometimes either boost the clarity control or reduce the blue luminance to improve distant detail. Lightroom 4 has just been released and I am pleased to say that in addition to a price cut, the RAW conversion engine has been updated and the editing controls for shadow and highlight are now more intuitive to use and certainly on the few comparisons I have made with Lightroom 3, the algorithm used seems to produce better results. These are probably the two most useful tools in Lightroom and I am pleased to see improvement. Lightroom 4 allows you to choose whether to convert any of your previously edited Lightroom 3 work to the new RAW conversion engine. You can still work with the old version and tools in Lightroom 4 but if you convert to the new expect to have to make some adjustments. A major reason I upgraded to Lightroom 4 was the inclusion of reverse geo-tagging. Most of my cameras don't have a built in GPS and the one that does takes so long to get a fix that I have generally taken the photo and switched the camera off before it knows where it is. Previous versions of Lightroom have been unable to import my navigation GPS's gpx file and to tag the photo files with their position in the files' EXIF metadata. I used a separate program called GPicSync to do this but that freeware program took ages to open all the RAW files, so I only used it with small .jpg files I had exported. 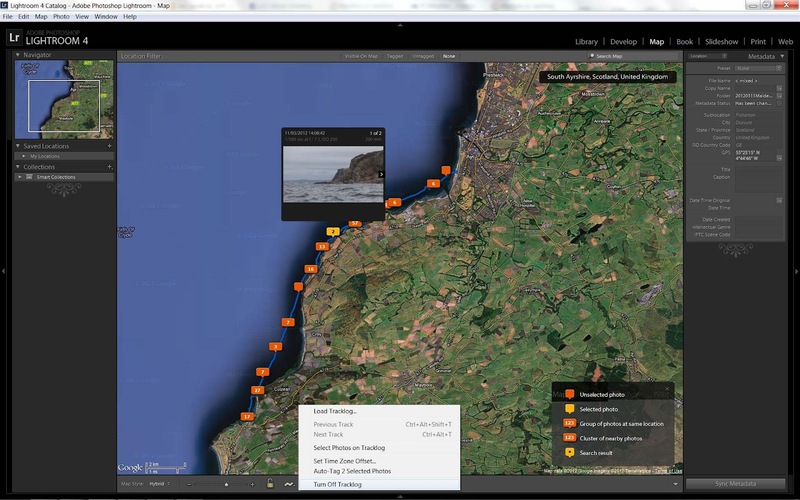 Now Lightroom 4 has an extra map screen which allows you to import your GPS unit's .gpx file and very quickly autotag all (or selected) photos with their position. You do need to ensure that the camera is set to the right time so that it is correctly synchronised with the GPS unit's time (which the GPS will get from the satellites). If you forget to do this there is a handy time zone offset slider that will also allow you to compensate if your camera is a few minutes late or fast. This is a great addition to Lightroom, which has speeded my workflow. All in all, Lightroom 4 has some welcome major improvements, which have made it a worthwhile upgrade for me. If you are not using Lightroom and are still using Photoshop or similar, then do yourself a favour, get yourself a copy of Lightroom 4 now! It is a really excellent program that will greatly enhance your workflow, when you get back from a photo shoot. You will end up with more time to compose and take photos rather than fiddling with them afterwards! Lightroom 4 is available for Windows PCs and Macs for £103.88 (Upgrade £59.09) free trial available. 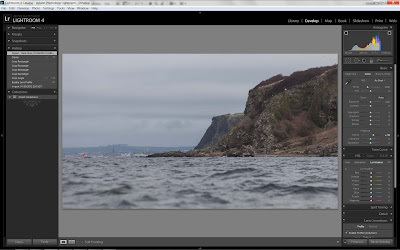 Anyway I recommend that Mac users should also try Lightroom 4 for themselves, it is a great program and it is available as a free trial download for Macs.